Doha, Qatar: A group of Northwestern University in Qatar (NU-Q) students met with marketing professionals from Memac Ogilvy, a marketing and communications company in Qatar, to explore career opportunities for students studying strategic communications. NU-Q has developed a program for its students – the Global Media Experience program – that provides students with the opportunity to visit publication houses, production studios, and marketing communications agencies in and around the region. Through these visits, the students are able to discover the different roles professional communicators hold within the organizations and to better understand how they can establish themselves for their future careers. “The Global Media Experience program allows students to see how the theories and mechanisms they are learning in the classrooms come together in the real world – and what that means for them as they explore various career opportunities in strategic communications, journalism, and the media,” said Everette E. Dennis, dean and CEO. In addition to meeting with executives at Memac Ogilvy, NU-Q students have also visited the communications and advertising agency ADabisc and global network BeIN Sports. 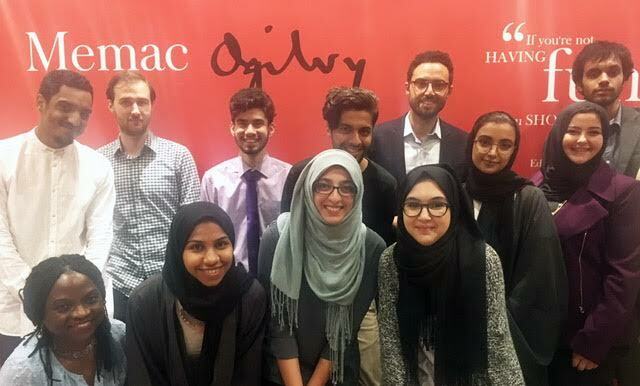 “After observing Ogilvy’s digital media campaigns on social media, I wanted to understand the process of how brands share their messages,” said Syed Muhammad Erzum Naqvi, a sophomore at NU-Q. Students were also introduced to the agency’s directors who presented the various functions creative agencies perform in defining and solving various communications problems – from client servicing to strategic planning. “I didn’t realize until this visit that strategic communications really is about effective storytelling and that it demands thorough research as well as creative thinking,” Naqvi said. Younes Mana, also an NU-Q sophomore, quoted the founder of the firm, David Ogilvy, who said “In the modern world of business, it is useless to be a creative, original thinker unless you can also sell what you create,” in explaining what drew her to the Global Media Experience program. “I’m interested in finding out how my skills can fit into producing communications solutions,” she added. “We’re a generation that constantly challenges the status quo. As long as you are critical thinkers, think outside the box, and have strong opinions, you’ll do very well in this field,” Ben Hamouda advised students. As part of its commitment to educate a generation of media and communications experts, NU-Q provides its students with numerous opportunities to interact and work with world-class communications professionals, including internships and residency programs in the region and abroad.